It may surprise you to learn that, due to the hormonal changes that take place during puberty, teenagers are at a higher risk of gum disease. 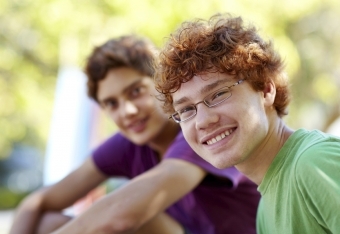 Luckily, there are various effective ways to reduce this risk for your teenager. While there are a few different forms of gum (periodontal) disease, in essence, it is an inflammation of the gums that is caused by a build up of plaque and tartar on the teeth. Gingivitis, which is the mildest form of gum disease, is the most common form of gum disease in teens. When gingivitis develops, it causes the gums to become red, swollen and inflamed, and to bleed easily. When gingivitis is left untreated for too long, it eventually becomes full blown gum (periodontal) disease. In periodontal disease, the gums pull back from the teeth and form pockets, in which plaque and bacteria build up. These pockets become infected, and eventually, because the body tries to fight the infection by causing the connective tissue around it to break down, teeth can become loose or even fall out. It's strange to think that puberty can have an impact on the heath of your teen's gums, but the hormonal changes that take place during puberty can in fact put some teenagers at a higher risk for periodontal (gum) disease. This is because the increased hormones levels result increased blood circulation throughout the body, gums included. This increases the sensitivity of teenagers' gums to food particles, irritation, and plaque, causing them to turn red and feel sore. A consistent, thorough oral hygiene routine is the answer! This includes regular brushing and flossing, and regular visits to the dentist's office for check ups and cleanings. If you think teen’s oral health routine needs some help, you can work together to get it back on track. First, make an appointment with your Smile Town Langley team. Our dentists and hygienists can give you all sorts of tips, advice, information and demonstrations that will help your teen improve his or her oral hygiene routine. Then, make sure your teen brings all this new information into his or her at home hygiene routine. Remind your teen on a regular basis to brush and floss, and provide lots of different toothbrushes, toothpaste, mouthwash, floss and dental picks (they aren’t immune to the novelty of uniquely flavoured and coloured flosses and toothpastes, even if they roll their eyes!). Put these dental health care products anywhere in your home where there’s a sink. This will make your teen's oral hygiene routine more convenient, and also serve as a reminder. Your teen will notice if you don’t practice what you preach! Demonstrate how seriously you take this by giving your own oral care routine a boost. It'll do you good, too.